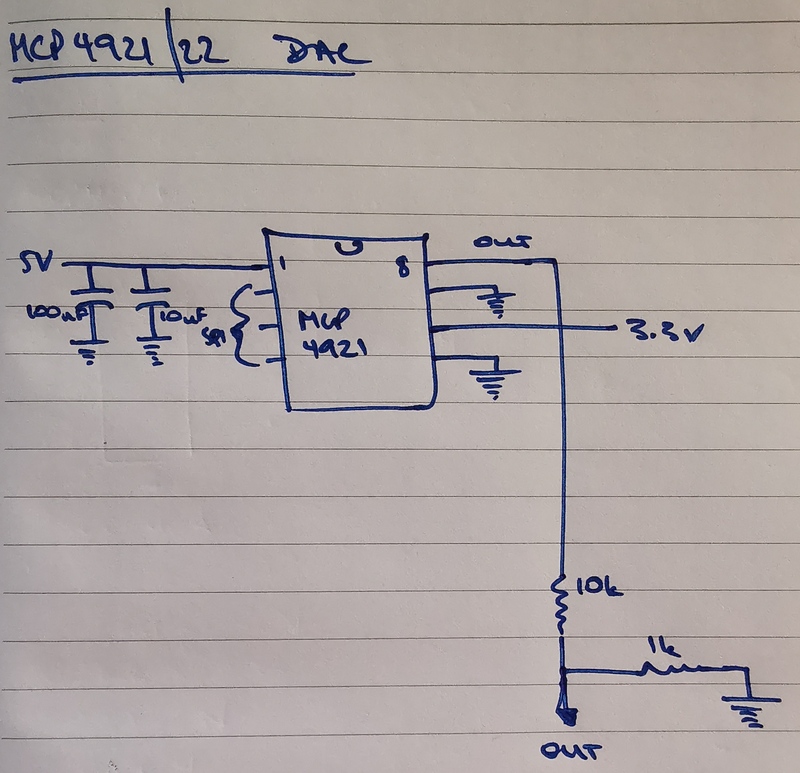 I’ve been playing recently with using a MCP4921 as an audio DAC on a Raspberry Pi Zero W, although a MCP4922 would be equivalent (the ’22 is a two channel DAC, the ’21 is a single channel DAC). This post is my notes on where I got to before I decided that thing wasn’t going to work out for me. Driving this circuit looked like this (noting that this code was a prototype and isn’t the best ever). The bit that took a while there was realising that the CS line needs to be toggled between 16 bit writes. Once that had been done (which meant moving to a different spidev call), things were on the up and up. This was the point I realised that I was at a dead end. I can’t find a way to send the data to the DAC in a way which respects the timing of the audio file. Before I had to do small writes to get the CS line to toggle I could do things fast enough, but not afterwards. Perhaps there’s a DMA option instead, but I haven’t found one yet. Instead, I think I’m going to go and try PWM based audio. 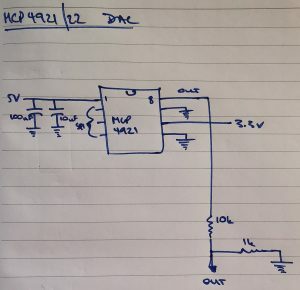 If that doesn’t work, it will be a MAX219 i2c DAC for me! Sigh. I remember why I can’t do PWM for audio. You can only do it on two pins which are already in use for SPI (pins 13/19 and 18), and I can’t move all the SPI devices to a single bus because the other SPI bus only supports a single SPI device.